If only I could do a few Christmas photographs and edit out the 'mess' of my house surrounding the decorations...too much work for this evening. 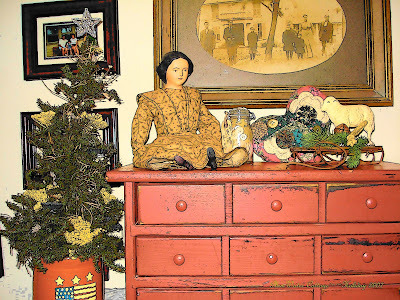 Instead, I've edited a photo from last Christmas which includes one of my very favorite dolls...from Miss Fanny Turgeon. I love this old red chest...I keep essential oils in it and I love the combined fragrances that waft from the open drawers. My classes are over for this semester; I had a final exam this evening after a long day at work. I'm counting down 'til the weekend--lots of holiday things to finish up, but more importantly, time to breathe. 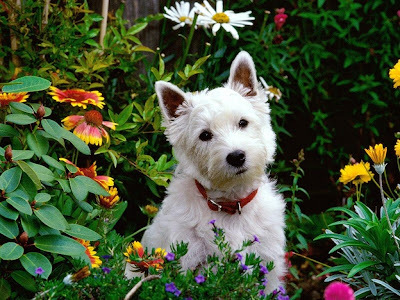 A Westie...the commercials this little dog is featured in (Target? Cesar's Dog Food?) just make me stop whatever I'm doing and watch the screen...what I don't do is pay attention to what is being advertised. What a cute little guy...please, Santa? Friday night, verging into Saturday morning...it's a flashback to my last year in high school. That's what happens when I fall asleep early-ish on the sofa--I wake up to infomercials. This one wasn't so bad...I remember watching this TV show every Friday night--usually with a group of friends. Friday night football or basketball games, followed by a sleepover at a friend's house...TV in the early 70's--Friday Night 'Fright' Theatre and Midnight Special. Good times. Here's the hat...directions followed explicitly---and it was easy! If I would have worked on it continually, it would have taken about four or five hours from start to finish. One skein of yarn (I used Plymouth Yarn-Galway), two sizes of needles, and voila! Christmas Moose approves. 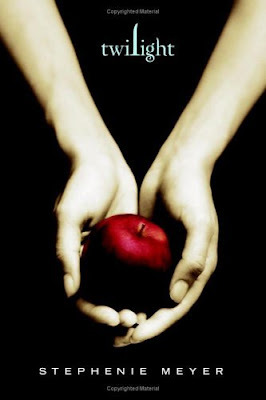 December 1, 2008, 6:15 PM. 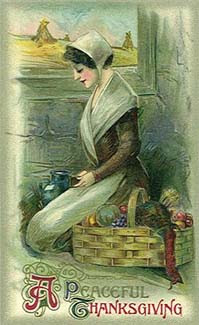 Teresa acquiesced and turned on the furnace. A new all-time record. December 1 already. I really can't believe how fast time passes; once we hit the slippery slope of Labor Day, in a blink of an eye it's almost time for Christmas. One day I complain about the heat and humidity, the next day (it seems) I'm griping about the damp and cold. My little projects are moving right along; knitting, piecing two lap quilts, and working on BUNCO gifts. I have two swaps to mail out this week...waiting for the paint to dry on two pieces. Just two more weeks of school--and I'm nine hours closer to my MPSA. My Christmas decorating has slowed to a crawl...a cold has overtaken me, and now I have most of my decorations pulled out, but there's just not enough enthusiasm to place them where I want them. 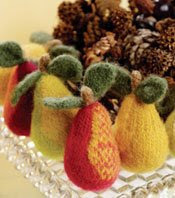 Instead, I've pulled out my bag o' yarn and needles and have been knitting pears. Lots of pears...I don't know why I'm so fascinated by them--partridge in a pear tree, perhaps? 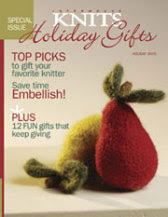 I found my copy of Interweave Holiday Knits 2006, and the felting yarn and needles right where I left them a year ago. It's turned out to be just the right-sized project for sitting and knitting. My friend Carol is stopping over after work today to put lights on my Christmas tree. How good of a friend is she??? I love decorating for Christmas, but I absolutely hate putting lights on a tree. That was the ex-husband's one and only job. I wandered to WalMart yesterday afternoon to pick up new lights...she's stringing the tree so that the lights can be left on forever. New lights, three green extension cords, and I'm all set. I'm glad I checked the cord color for the lights before we got to the cash register...they were white; I needed green. All is well. I've pulled out my Rubbermaid totes of Christmas decor...Santas, snowmen, the works. Photos soon to follow! 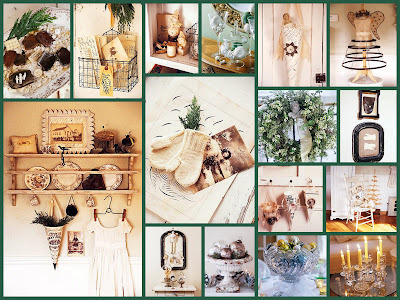 Tho the weather (traffic) outside is frightful, inside it's warm and cozy with vintage white Christmas decor. 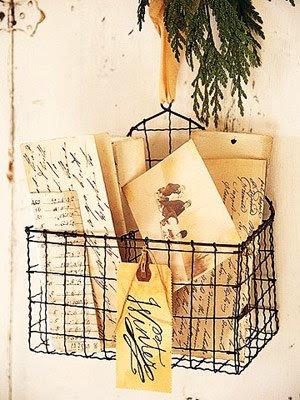 Images are from the Better Homes & Gardens site...great decorating ideas can be found there. What a week it has been! I'm now really thankful for a few days off. Megan and I will be spending Thanksgiving at a friend's house...we're looking forward to the good food and good company. I've been meaning to share these pictures of a purchase I made on Etsy about a month ago...it's a handknit pear filled with lavender. I love everything about it...the color, the texture, and of course--the scent. Hand-Me-Downs. Cute stuff, great prices. Last Saturday I had a booth at a craft show. The location was a high school, and it was a fundraiser for the band boosters. My little table was filled with earrings...and at the end of the day it was filled with more earrings. I sat and made earrings all day long--and only sold 4 pairs in the course of the day--3 pairs to people I knew (and who work for the library). I ended the day being $5.50 in the hole--minus $2.00 for the booth space, and I spent $3.50 for a bowl of their locally famous loaded potato soup. I once again took my box of earrings in to work on Monday...sold more earrings there before 8AM than all day Saturday. Word of mouth buzzed through the library, and it's been a good sales week. After Thanksgiving weekend, (the box went home with one of my 'biggest' customers whose sisters and sis-in-laws want to see them) I'll finally post them in my Etsy shop. It's cold here...and it doesn't look like it's going to get any warmer any sooner. I'm still waiting for Indian Summer. In the meantime, we're entering the final stretch on turning on the furnace (Thanksgiving weekend is the target date). I'm so glad my daughter is on board with this little experiment in self-torture. My companion lately has been my Lasko ceramic heater. This bad boy puts out some serious heat...I purchased it at Sam's Club three winters ago and it runs quietly and efficiently. I heart it. The only bad thing about not turning on the furnace is that once I get home and burrow under a blanket with the heater blowing on me, I don't seem to get too much else done; maybe a little knitting or reading, but certainly no housework. Brrrrrrr. 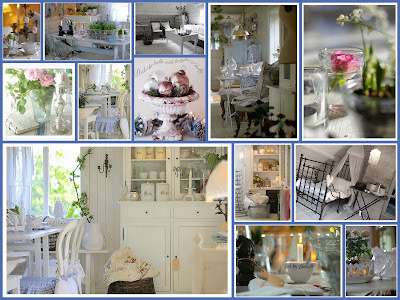 Visiting Swedish blogs...one of my favorite things! It would be much nicer if I could read the blog posts, but the pictures posted are just so beautiful no translation is necessary. If you haven't, visit some of these blogs(three great ones are listed in my sidebar)...it's almost as good as a trip abroad. Today's simple pleasure...worldly armchair travels. I've heard it's International Button Week. I love playing with buttons and beads...it's my new therapy. Today's Simple Pleasure: Bubble baths followed by flannel pajamas and slippers. Bliss. Join me in listing your Simple Pleasures...from now (and my count is off, so think back to last Wednesday to begin!) through the end of the year...50 days worth, start on a list of the little things that make you happy...it's always fun to read everyone's list. Are you almost always on the same wavelength as your friends? Last Saturday, before we left for our annual outing to New Harmony, my friend Carol and I exchanged birthday presents. When I opened the front door to let her in, I had to chuckle...she had packaged my birthday present in a black with white accented storage box...my present to her was the opposite...white with black accents. We've done this before in clothing; several summers ago we were going to attend a Blues Fest across the river; she dressed in white/black toile capris with a black tshirt and I was in the opposite...black/white toile capris with a white tshirt. Crazy. 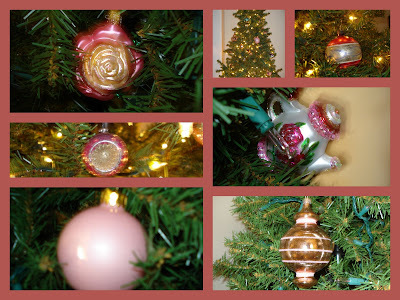 My gift from Carol were these beautiful vintage ornaments. Aren't they pretty? Country Living (online) has a sweet little wrapping station set-up. Everything is there, in its place. This weekend would be a good time to organize your wrapping supplies...and make a list of what you need for the upcoming wrapping season. Visit Beverly at How Sweet the Sound for more pink posts! Dark...that's what seems to be outstanding about this time of year. Dark in the morning while getting ready for work, dark in the afternoon while coming home from work. 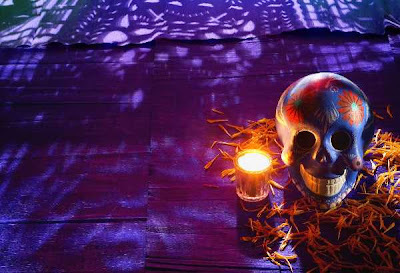 Lighting a candle casts a warm glow on a cool, dark evening. The Country Living website has the 'how-to' info on making candle cups. I think these egg cup candles are just so charming...here's where to find the information. TGIF...I'm looking forward to a weekend of nest fluffing, jewelry making, and relaxing. I guess I should have saved this for a Pink Saturday post, but since I've latched on to a 'rogue' internet connection, I thought I'd go ahead and do a Monday post. If it turns out okay, I'll add a few more to my items for sale at the upcoming craft show on Saturday the 22nd. In my spare time, I've been making lots of earrings and a few necklaces. I'll post a picture when I finish my little flower. Saturday was a beautiful autumn day...a bit brisk, but just beautiful. Our stops in New Harmony included The Women's Institute and Gallery where we saw a display of monofilament art. The Gallery also has a display honoring the women who have won the Nobel Peace Prize...Heroines of Peace. "The" place for kicking through leaves! Black and white seemed to be a big theme in Christmas decorating. One of the larger shops in New Harmony was having an open house...complete with a cooking class, wine tastings, and of course, shopping. No pictures of that shop, but it's called The Mews. It's an endlessly winding shop of old and new, a mixture of antiques, clothing, jewelry, accessories, home decorating, scents, furniture (old) and food. We had a great time. What a beautiful day...crisp, sunny, almost perfect! The maple tree in this picture is always so beautiful...I was waiting for the color to be just right, but I was afraid if I waited too long it would be leafless. The city designated my street as one of the many bicycle paths in town. On a good day, it's hard to even cross the street. Don't know how well the bicycles will fare. Pretty amusing...we all thought they were going to actually make bicycle lanes. The hydrangea bush that bloomed so profusely this season. The flowers are still pretty, and the new blooms are a wonderful color. My friend, the garden spider. This guy joins us for breaks every day at the library. He's built the perfect web on a garden light on the patio. Kinda scary, but beautiful. My camera battery is charging now, and I'll be taking lots of pictures in New Harmony tomorrow. Have a great weekend! It's amazing just how much more I can accomplish at home if I'm not hovering around the laptop. I'm 'jonesin' on blog deprivation...can't wait to catch up with everyone...but that will have to wait until the weekend. My internet provider will not replace my defective (probably overused) cable modem, so I need to purchase a new one--when I get a chance to go look for one. I'm anticipating a quiet evening at home, a pot of tea (or a cold beer), feet propped up, and planning for a fun weekend off. One of my favorite little towns is having a holiday open house, and one of the shops is known for the fabulous food they serve during this time. My friend and I will be heading to New Harmony on Saturday...can't wait! Fortunately, I had the opportunity to vote at work last week. I'm glad this election is almost over...it seemed like it would last forever. Change is good...I hope good change is what we get. I have had so much trouble with my internet connection for the past day and a half...sometimes it works, sometimes it doesn't. 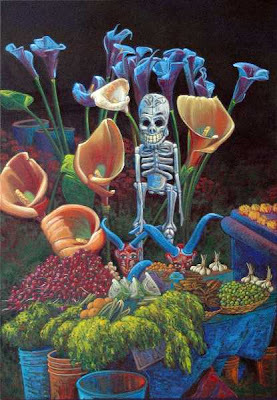 Today it died (day of the dead??). Time to purchase a new cable modem. 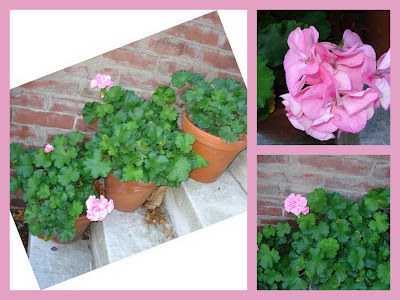 My pink contribution for today is a picture of my geraniums; they look pretty good for the first of November. On my way out to find a wireless connection (my local library, of course!! ), I heard a commotion...motorcycle cops, state police, local police, etc.e blocking off the cross streets in front of my house. I could see a motorcade heading my way....Joe and Jill Biden (and a lot of other 'dignitaries') were on their way out of town. I probably should have walked over to hear his speech, but it was just too nice of a day to abandon a little yard cleanup and outdoor enjoyment. Go visit Beverly at How Sweet the Sound for more pink! 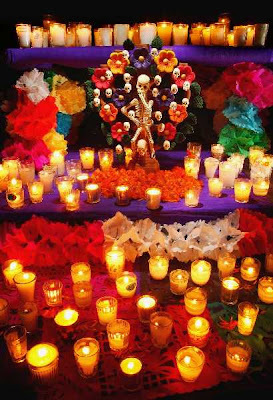 The Evansville Museum of Art, Science and History has a Day of the Dead Exhibition featuring the tradition, symbols, and heritage of Mexico. 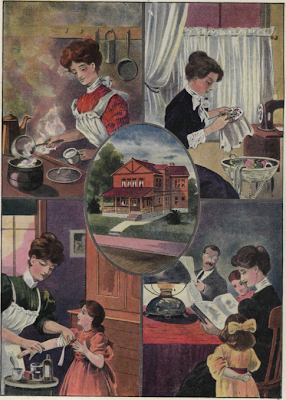 The exhibition runs through the beginning of January. I've decided to take a space at a craft show on Saturday November 22. A woman at work put me in contact with the show organizer, so now as I sit in my chair and contemplate life, I'm also making jewelry. I've made probably 50 pairs of earrings in the past week, sold more than half of them, and taken orders for more. A little more bead shopping is on the agenda for this morning, and then it will be time to select, wrap, embellish, clip, and hang.